Universal health coverage (UHC) – a health system where everyone has access to the health services they need and can take advantage of them without risk of financial impoverishment – is seen as a critical component of sustainable development for low- and middle-income countries. To progress towards UHC goals, however, policymakers must first be able to define, measure, and monitor UHC. 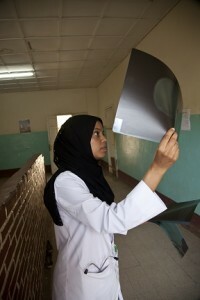 A doctor in Gondor, Ethiopia reviews an X-Ray. Photo by David Page. To support countries in this work, the World Health Organization (WHO), World Bank and other partners, including USAID, are developing guidelines, approaches, and best practices for measuring and monitoring progress towards UHC. The WHO’s World Health Report 2010: Health Systems Financing: the Path to Universal Coverage proposed a widely-accepted conceptual framework for UHC. To advance the global discussion on the availability, feasibility, and relevance of various candidate indicators for UHC measurement, the HFG Project conducted case studies in Ethiopia, Senegal and Cote d’Ivoire analyzing the approaches used to monitor progress there. HFG gathered the views of the stakeholders on the ground and other partners regarding the relevance of the WHO indicators and stakeholders’ preferences for particular indicators, and also analyzed each country’s capacity to provide the information. The case studies explore which indicators are being used already, evaluate each country’s institutional capacity to collect relevant data and generate a set of proposed indicators, and consider the implications of these experiences with UHC measurement for other countries and the international community.